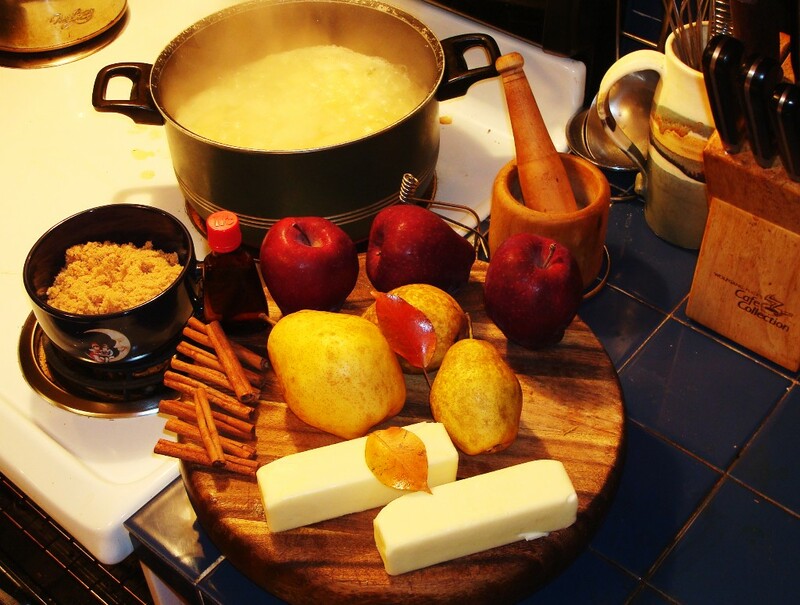 Pear butter, apple butter, plum butter, and peach butter have long been Fall staples up here in the Boston Mountains. Pear butter smeared on a toasted English muffin…is my idea of what scrumptious truly means! My neighbor at the top of our hill has two pear trees that were absolutely loaded with fruit a couple of weeks back. Never the bashful soul, I asked if he would share a few if I returned to him, in kind, some homemade pear butter. His answer was a positive. I love a good, fair barter. Last night, using my best chef skills, I cooked up a mess of Bartlett pear butter. Tomatoes, green beans, squash, peppers, and carrots are typical vegetables that mountain natives preserve in late Summer. Traditionally fruit butters and jellies are canned a little later between early and late Fall. By allowing your fruit to ripen a bit longer, you increase the natural sugar content. This makes for a more natural sweetness to your final product. Also you only have to add a minimal amount of sugar or none at all. Place the diced pears in a large sauce pan with water and bring to a rolling boil for 5 minutes. Cover and reduce heat to a simmer. Add remaining ingredients. Cook for about 30 minutes, or until mixture is flavorful. Using a potato masher, mash until it reaches your desired consistency. Be careful not to crush the allspice berries. Fill your favorite Mason or Ball jars, seal lids tightly, and place on counter-top upside down for about an hour. Turn upright and allow to cool to room temperature. This entry was posted in Flora and Fauna, Folklore, Medicinal Fruit, Necessities, Recipe, Traditions. Bookmark the permalink.